July 9, 2012 - Flying behemoths like the Airbus A380 double-decker mesmerize fliers, but the real muscle lifting the aviation business comes from their smaller, single-aisle cousins like Boeing’s next-generation 737 MAX planes, advanced Airbus 320neo aircraft, and China’s Comac C919 jets. A new market outlook report released this week by Boeing predicts that the world’s aircraft manufacturers will deliver over 23,000 single-aisle planes valued at $2 trillion by 2031, as opposed to 790 jumbos valued at $280 billion over the same period. All that growth, which is coming primarily from China, India, and other Asian countries, means a market for some 46,000 jet engines. Billion Dollar Baby: Boeing is projecting a $4.5 trillion market for 34,000 new airplanes over the next 20 years, as the current world aircraft fleet doubles in size. Most of the growth will come from next-generation single-aisle aircraft. 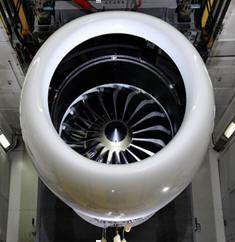 Many will be powered by the LEAP engine, here shown at a CFM test bed. The new Boeing, Airbus, and Comac planes are utilizing innovative composite materials and technologies that need engines to match. CFM International, a joint venture between GE Aviation and the France’s Snecma, is developing a family of advanced LEAP engines that fit the bill. CFM will show the engines during the 2012 Farnborough International Airshow, which starts Monday. The company plans to run the first full LEAP engine tests mid-next year, and start deliveries in 2016. A lot has been written about the LEAP. The engine brings the efficiency found in larger, wide-body, long-haul engines to the single-aisle short-haul market, where durability and quick turnaround between takeoffs and landings are paramount. The LEAP, which is part of GE’s ecomagination portfolio, is a high-bypass turbofan engine sporting innovative features and materials that reduce its weight by several hundred pounds, and shave fuel costs by 15 percent, compared to current CFM models in its class. That translates to $12 million in savings per plane over 15 years. Advanced engine design also cuts noise and emissions and lowers maintenance demands. What are the new features? The engines employ several types of advanced materials, including for the first time Ceramic Matrix Composites (CMCs). GE has been developing the material for two decades. CMCs are as tough as the best performing nickel super-alloys currently used to manufacture engines, but can operate at much higher temperatures (2,400⁰F), which makes the engines much more efficient. The LEAP engines also use parts manufactured by a new revolutionary process called additive manufacturing, or 3-D printing. The method allows GE to “print” metal parts by building up the material, layer-by-layer, rather than using the traditional forging and machining process. This method gives GE designers the manufacturing freedom to engineer parts with complicated geometry and structure that improve efficiency and cut weight. The LEAP is already one of the bestselling engines in CFM’s history. The company’s orders and commitments reached $47.5 billion in 2011, from customers like Southwest Airlines, Virgin America, and Qantas. CFM has received LEAP orders valued at billions more this year. The GE-built portions of the LEAP engines are fully assembled in the U.S., at GE plants in Asheville, North Carolina, Peebles, Ohio, Hooksett, New Hampshire, Victorville, California, and elsewhere.